I hate asking for help. I don’t like looking weak. But the truth is, I don’t have it all together. I think there are times when we all need help, advice, encouragement, and support. I have built my entire website around providing practical and effective ways to live frugally and enjoy life on a budget. 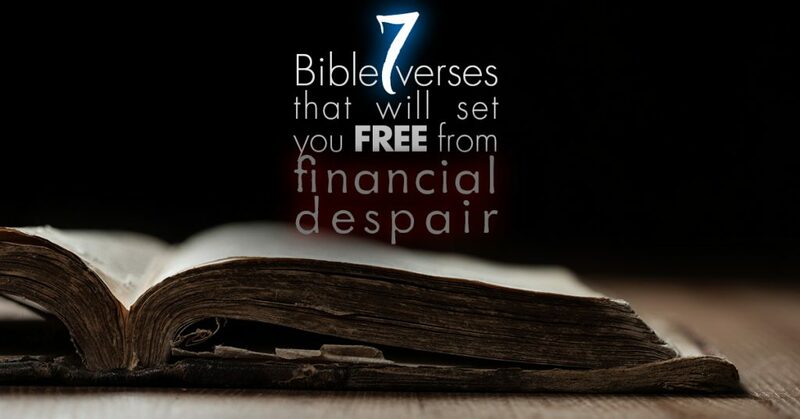 Today I am going to share maybe the most practical thing I can to help set you free from financial despair. As some of you may know, I am a believer in Jesus Christ and that is central to my story. He is the One who guides me and my family, and I owe Him everything. He gives forgiveness, strength, wisdom, and peace to whoever asks Him. But here’s the thing, I had to ask for help. We know that God isn’t a genie that we get 3 wishes from, and He isn’t an angry lightning-bolt-throwing grump like Zeus. He’s a good, happy, loving Father who cares for us, likes helping us, and hears our voices – even our quietest whispers for help. In my book, The Recovering Spender, I talk about how we all need to get help from the One above. I realize that you may not have the same views on faith that I do, but I have seen God’s helping hand in my life more times than I can count, and these 7 Bible verses about God’s character and His promises have been real anchors for me and have helped me in emotionally hard times, in the normal day-to-day craziness of life, and also helped me escape financial despair. The Lord is my Shepherd. I lack nothing… Even though I’ve heard it many times, I still get blessed every time I go through it. Every verse in this Psalm gives us a different piece of the picture of our relationship with God. Being confident in our hearts about our God-given identity is vital when trying to overcome difficulties or financial despair. We need to know deep down that God is with us, leading us, protecting us, and fighting for us – not because He has to, but because He wants to, because He loved us first. Specifically, Psalm 23:5 has really stood out to me recently. It says, “You prepare a table before me in the presence of my enemies…” It says, “MY enemies”. To me, this confirms that God is fighting for me. Almost as if He is saying, “Your enemies are now MY enemies. I take this personally.” Like how if my children were in danger and needed help, I would do whatever it took to protect them. The next thing that stood out to me was how it says God “prepares a table.” Historically, this was a large feast with all the trimmings. It is astounding that God is the one that prepares the table for us, like a humble waiter. We can rest in the peace of God's provision as He fights on our behalf – and we can be sure of His victory. I've always said that your spending is a reflection of your values. But it turns out that Jesus said it first. This verse cuts right to the heart… and was probably the most convicting to my heart when I was dealing with my spending issues. When Jesus is talking about “your treasure”, he's referring to your desires, your money, your spending. If you claim that your life's values are family, faith, your health – but spend WAY too much money on things like designer clothes, restaurants, cars, whatever it may be – then you have misaligned values. In fact, Jesus is basically saying that your values are NOT where you claim that they are. Look at where your treasure is. That is where your heart is. This is something that I have to watch in myself. Since I am a Recovering Spender, there might always be that draw in me towards spending money on ‘stuff'. So I need to keep my heart full of the “good stuff”, those true values in my life. And when my heart is in the right place, my treasure (and my money) is right there too. I talk LOTS about the relationship between your money in your heart in my book, The Recovering Spender. The importance of this money-heart connection cannot be overstated. Fear not – Easier said than done, but we really need to trust that God will come through for us. I think we would swap out “Fear” with “Worry” or “Stress” and the message would be the same. God’s Spirit is His gift to us to help us. This says that His Spirit does not make us afraid, but gives us strength, love, and self-control. I am so thankful that He helps me to be confident, strong, and loving. On top of that, He says that He can give us self-discipline which is the reason why I can say, “No” to overspending. In today's culture of ‘get it now, pay for it later', it's too easy to not take debt very seriously. But it's clear that God has a very negative view on debt, and an even more negative view of not repaying that debt. But I don't want to dwell on the negative part of this verse; I want to focus on the comparison to the righteous person. Note that it doesn't say “but the righteous repays his debt.” It says “the righteous is gracious and gives.” God simply wants us to be focused on helping others. When I was writing my book, I took a survey of over 2,000 women and their spending habits. One surprising trend I found was that those who felt that their spending was out of control also were huge givers and had huge hearts. This is where God wants your heart to be. Just think of the good that you will do for others once you are free of debt once and for all! God is a lot smarter than we are (that’s an understatement!). If we trust Him, invite Him into the process- into the struggles, AND into the victories, He promises to direct us from His point of view. That’s a relief! God gives us just what we need to get through ANY situation if we ask Him. The help He gives us isn’t like when my kids “help” my husband build a porch. It’s actually the other way around. He is building something magnificent with our lives, and we get to screw in a couple screws and then feel confident and proud about how much we “helped” – and God is glad and smiles about it. Don’t forget to lean on the Lord a little more, Ask Him for help more, and be sure that He is fighting for you! 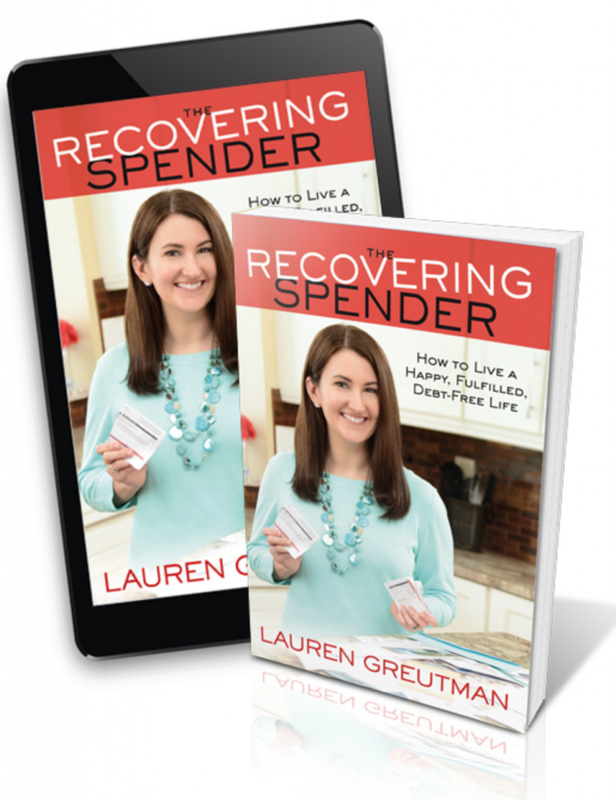 In my book The Recovering Spender, I talk about how I learned how to actually enjoying budgeting. This book is the financial book for the person who doesn’t enjoy talking about money. It is for the person who wants to learn how to get out of debt once and for all. 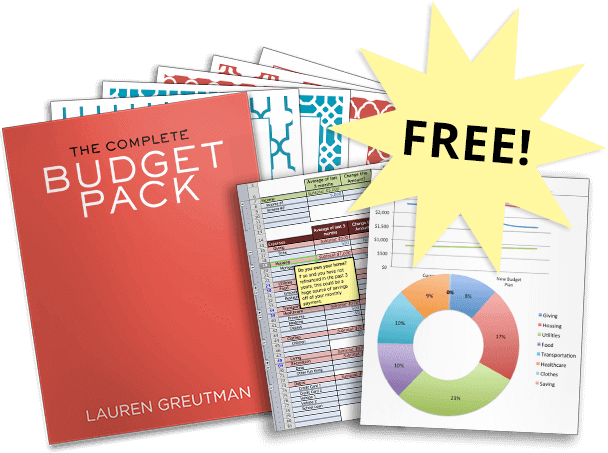 If you’ve failed at budgeting in the past, this is the book for you. Those were all great verses. I just wanted to add a little context to your last verse, as it works well with your point. Backing up a verse you’ll see that Paul is talking about contentment. The wonderful thing here is God give us strength to be contended in every situation! Thank you. I will share this with my family; especially, my Wife who has been frugal in every way with our law practice. She’s the director and CFO, but I feel we’ve (I have) let her carry the financial burden way too long. Wonderful! An eye opener.Thanks and God bless. I read the scriptures and they were very helpful. I do not have a.job but have my husband SSI and want to be able to pay off all my debts and lower my mortgage and I have faith that God is in control and I trust him.